This easy clam chowder recipe is simple enough for a weekday meal, sophisticated enough to serve with a glass of wine, and pretty enough to show off on Instagram. Sit down with a bowl of comforting soup, a loaf of crusty bread, and great conversation. 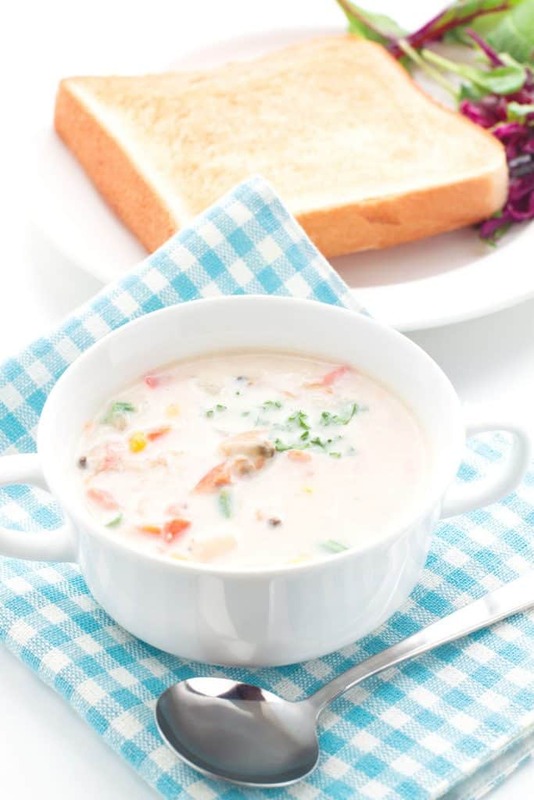 I would like to say this is the best clam chowder recipe EVER but…I’m from Minnesota. Being from a land-locked state does not make me an expert in anything with seafood. At all. Ask me about venison, or cakes, or or…walleye and I might be considered an expert. But…as of right now, including the chowder I’ve had while traveling the seaboard, this is the BEST clam chowder recipe ever! I’ve eaten a lot of the stuff! 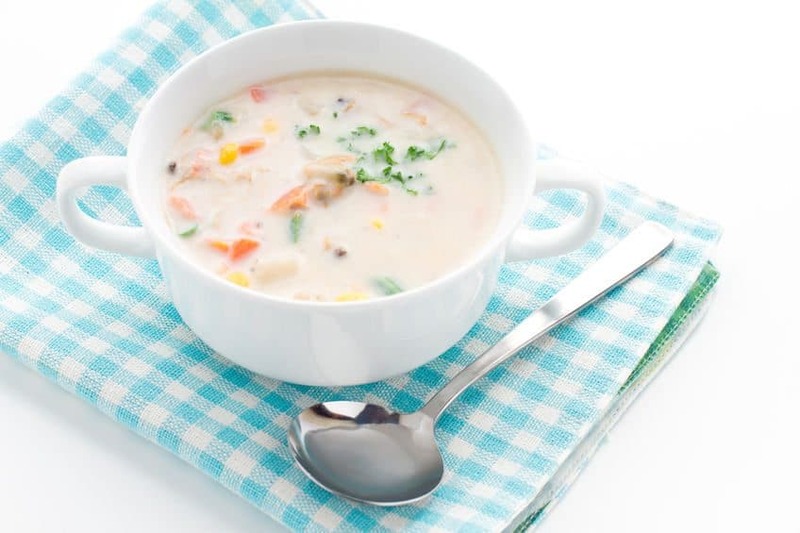 What are the two main types of clam chowder? 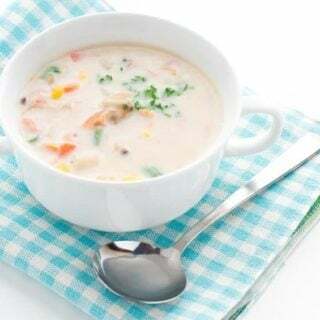 Usually, you will think of New England clam chowder (which this one is) or Manhattan clam chowder. The New England is a white sauce base and the Manhattan is a red sauce base, if that helps :). I can’t say I have ever had the Manhattan version, to be honest. What spices do you put in clam chowder? Guys, I’m pretty sure Old Bay seasoning was made solely for clam chowder :). I’m probably being dramatic about that. 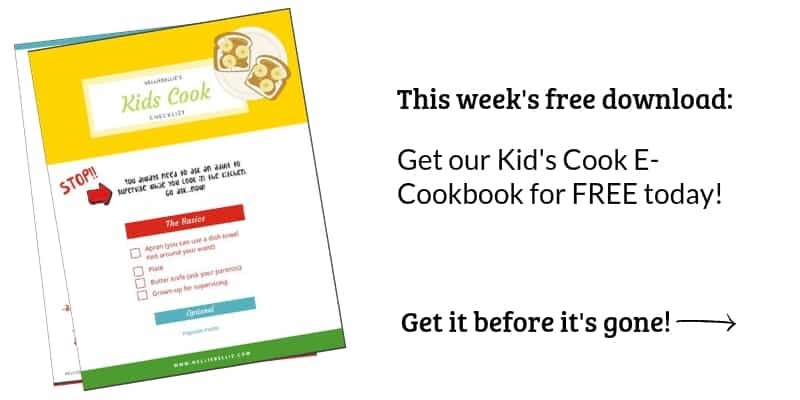 But really, it’s perfect for keeping this recipe simple AND delicious! I dare say that I would love! love! if someone who knows something-something about clam chowder would try this and tell me how close to authentic I am (besides the issue of the canned clams. Can’t be helped). If it’s really bad…much worse than the real thing then just don’t tell me. I like living in the world where my clam chowder is delicious. Even if it’s not authentic. Delicious is worth something. Simple and delicious is what I’m all about! Gourmet Mushroom Soup || This soup is creamy and full of mushroom flavor. Soooo delicious! One Pot Sweet Potato Chili || A family favorite that is full of comfort, flavor, and nutrition. Roasted Cauliflower Soup || This is an easy and simple soup that you’ll make again and again. In a large skillet put the onion, carrot, and potatoes. Add the clam juice from the canned clams. And then add enough water just to cover the veggies. Let cook over medium heat for about 20 minutes…or until soft. While those are cooking add butter to a large soup pot, melt it. Whisk in the flour, then the cream and milk right about the time the veggies are done. When the veggies are done add them, the thyme, Old Bay, salt and pepper to the large soup pot. Stir everything. Heat but don’t boil. Stir the clams, vinegar, and wine in just at the end. Taste and add more seasoning as needed. Serve warm with fresh parsley on top. And bread. Always serve with bread…yum! Excited to give this a taste. A quick question: When you add your veggies to the cream mixture, are you adding just the veggies or the liquid with them as well? Thank you! What a good question! I usually just add the veggies. But, if you like your chowder a bit more runny you can certainly add some of that liquid. I made this tonight. I used potato starch to thicken, and almond milk for dairy milk, but used heavy cream. My husband has a swallowing problem right now so I have been making creamy soups. For this soup I immersian blended 75% of the veggie/broth. This made a super satiny rich soup. He loves clam chowder and this was my first time making it. It was so good, like a fine dining restaurant soup. The wine was the key to that I think! I would love to share a photo! I am sooo glad to hear that! I love the idea of the immersian blender to make it creamy. Super smart! If you would like, you can email [email protected] a photo. We would love to share it on social media. Thanks! Wow Nellie, does this look good! I love clam chowder but can’t remember the last time I ate it. Mmmm, I can smell it too. Amazing! I haven’t had this in a while and it’s making me all sorts of hungry. Thanks for stopping by! It is delicious!! In fact, this is a soup night. Hmmmm.